A biologist in the College of Arts and Sciences has been honored for her work as a student mentor by the University’s Center for Fellowship and Scholarship Advising (CFSA). 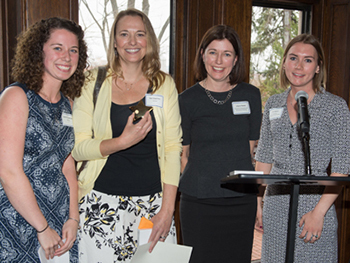 CFSA Mentor of the Year Kari Segraves holds up her award with, from left to right, Goldwater winner Jessica Toothaker ’17, CFSA Director Jolynn Parker and Fulbright recipient Kait Hobson ’16. Kari Segraves, an associate professor of biology, was named Mentor of the Year at a special ceremony this spring, hosted by Dr. Ruth Chen at the Chancellor’s House. Segraves is the inaugural winner of the award, created to distinguish the yearlong work of faculty members who inspire and mentor Syracuse students applying for national scholarships, many of which can enormously influence the academic path of a student. The recognition is also a reflection of her exemplary dedication to her students, through the establishment of multifaceted research opportunities for undergraduates, and her invaluable participation in numerous mock interviews in support of potential scholarships. In addition to the ceremonial recognition, Segraves’ name will be engraved on the newly created Mentor of the Year plaque that will hang in the Honors Program office at 306 Bowne Hall. An evolutionary ecologist, Segraves conducts biology research that focuses on understanding how species interactions increase biodiversity. 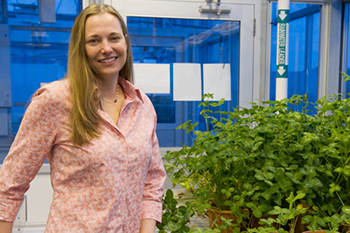 Most recently, she and her colleague David Althoff, assistant professor of biology, were awarded a $150,000 grant from the National Science Foundation designated to support their research on how interactions between species can cause new species to form. What was your reaction to being named the inaugural Mentor of the Year by CFSA? I was deeply moved and honored when I heard about receiving the award. As a mentor, one of your hopes is that you make a positive impression on your mentees with the advice and help you give. I work with an amazingly talented group of students, and it was touching to hear how I had made a difference in their lives. What’s involved in being a good mentor to students? First and foremost, I think that you need to gain your students’ respect to build a trusting, working relationship. Students share a lot about themselves and their dreams, meaning that they need to trust their mentor not to judge. I also think that part of being respectful is remembering that it’s their lives and their decisions to make. My role is to be a good listener—to understand the issues and then offer them the best advice I can. Sometimes the best advice is in asking the right questions to get them thinking about what they really want. Ultimately, I believe that the students are the ones who should take control. I trust my students to make the right decisions for themselves. What has your philosophy been when working with students to help them succeed and achieve these remarkable accomplishments? I tell students to follow their hearts and discover what is going to make them happy in life. You’re only going to work hard and put in the effort for something that you think is important. Many of my mentees have the talents and abilities to do anything they set their sights on, and helping them figure out what they really want is a big part of my role. I also try and teach students to work within their limitations and not try and do everything. Doing too much can be just as much of an issue as doing too little. Students need to find the right balance between academics; extracurricular activities and career-building to feel like they can make accomplishments in their lives. Has there been one student, or experience, in your role as a faculty mentor that stands out? It’s very difficult to pick just one as there are many! In thinking back, I had one student when I first started at SU who was bright and hard working but unsure about what she wanted to do in life. She didn’t have the right life balance or motivation because of it, and nearly dropped her major and all hope of having a career in biology. In the end, she just needed a little encouragement and someone to ask her the right questions. She started gaining in confidence and decided to continue on in biology, much to my relief. After getting to know her better, I suggested a potential profession for her that turned out to be a good fit. She is now successful, confident and excelling in her career. The key was working with her to find a path that she felt was going to make her happy. It has been particularly rewarding to see her mature and grow over the years after she left SU. This has been a recurring story for many of my mentees. Sometimes the most difficult step is identifying what you really want to do with your life. What advice do you think is most important to impart to students as they move through their academic career here at Syracuse? As a graduate student, my research mentor gave me one piece of advice that resonated with me and is something I try and impart to all of my mentees who are struggling with career decisions. My advisor believed that life is too short to spend it working in a job that you don’t love. If you love your job, then going to work is something to enjoy. College is a fantastic time to explore your options and find the pathway that’s right for you. You need to identify that “thing” that gets you excited about going to class and learning more on your own. When you realize that you’ve just spent your Saturday evening doing research on a particular subject when it wasn’t for class, then you know you’ve found a potential career path.